The brown dog tick, Rhipicephalus sanguineus Latreille, has been found around the world. Many tick species can be carried indoors on animals, but most cannot complete their entire life cycle indoors. The brown dog tick is unusual among ticks, in that it can complete its entire life cycle both indoors and outdoors. Because of this, brown dog tick infestations can develop in dog kennels and residences, as well as establish populations in colder climates (Dantas-Torres 2008). Although brown dog ticks will feed on a wide variety of mammals, dogs are the preferred host in the U.S. and appear to be a necessary condition for maintaining a large tick populations (Dantas-Torres 2008). Brown dog tick management is important as they are a vector of several pathogens that cause canine and human diseases. Brown dog tick populations can be managed with habitat modification and pesticide applications. The taxonomy of the brown dog tick is currently under review and ultimately it may be determined that there are more than one species causing residential infestations world-wide (Dantas-Torres 2008, Levin et al. 2012). Figure 1. Life stages of the brown dog tick, Rhipicephalus sanguineus Latreille. Clockwise from bottom right: engorged larva, engorged nymph, female, and male. Photograph by Lyle J. Buss, University of Florida. Infestations in residences and kennels usually start with few ticks that are brought inside with a dog, which has been away from home. Likely sites where dogs acquire brown dog ticks includes sites where dogs from many sources congregate, such as grooming facilities, dog kennels, veterinary clinics, and already-infested residences. The infestation can reach high levels, seemingly very quickly. However, the early stages of the infestation, when only a few individuals are present, are often missed completely. The first indication the dog owner has that there is a problem is when they start noticing ticks crawling up the walls or on curtains. The brown dog tick is found worldwide and is considered the most widespread tick species in the world (Dantas-Torres 2010). It is more common in warmer climates and is present throughout Florida. Brown dog ticks are found on dogs, in kennels and houses, and occasionally on wildlife. Eggs of the brown dog tick are spherical and dark brown in color. Larvae have three pairs of legs with a body size of approximately 0.54 mm in length and 0.39 mm in width (Figure 2). Nymphs and adults have four pairs of legs and look similar except nymphs are smaller than adults. Nymphs are 1.14 to 1.30 mm in length and 0.57 to 0.66 mm in width, while adults are 2.28 to 3.18 mm in length and 1.11 to 1.68 mm in width. Nymphs and adults are reddish-brown in color with an elongated body shape and do not have ornamentation (markings) on the back (Walker et al. 2005). Female brown dog ticks increase their body size a hundred-fold during feeding, reaching the size of a raisin (Sonenshine and Roe 2014). Figure 2. Nymph (larger tick) and larvae of the brown dog tick, Rhipicephalus sanguineus Latreille, on a dime. Photograph by James Newman and Leah LeFevre, University of Florida. Frequently, when people report having a tick infestation, they often believe that they have different types of ticks in their home or on their dogs, when in fact they are observing multiple life stages such as large adults and small seed ticks or larvae. The different stages (larva, nymph, and adult) are progressively larger in size and once a blood meal is taken, tick size within a stage become larger and more variable (Figure 3). Many features used to identify the stages and sexes are difficult to see without a microscope. The scutum (darkened shield-like feature) on the dorsal surface (on the back) covers the entire dorsal surface in males, but only anterior dorsal (area just behind the mouthparts) surface in females (Figure 1; Sonenshine and Roe 2014). Males and females can be difficult to distinguish without examining them with magnification due to their lack of coloration, but males take only small blood meals while females take large meals and increase dramatically in size. Nymphs are distinguishable from adults primarily by size, but this is unreliable and so these two stages need to be confirmed by microscopic examination, and usually by an expert. Figure 3. 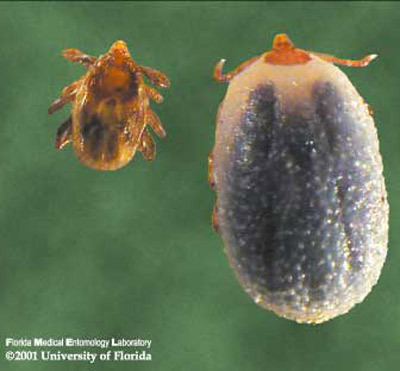 Unengorged or flat (left) and blood-fed engorged (right) brown dog tick, Rhipicephalus sanguineus Latreille nymphs. The increased size results from ingesting a large volume of blood. Photograph by James Newman, University of Florida. Among ticks in Florida, the brown dog tick is easily recognized by its color, body shape, and hexagonal basis capituli (flat surface where mouthparts are attached). 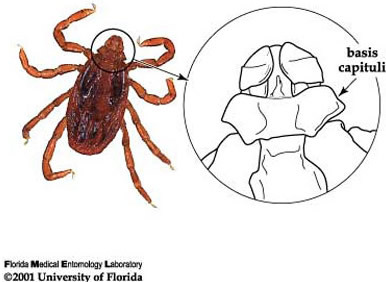 The hexagonal (6 sided) basis capituli is a particularly good identifying characteristic (Figure 3; Dantas-Torres 2008), as only one other tick species with this feature has ever been found in Florida (Rhipicephalus (Boophilus) annulatus Say, the cattle fever tick). 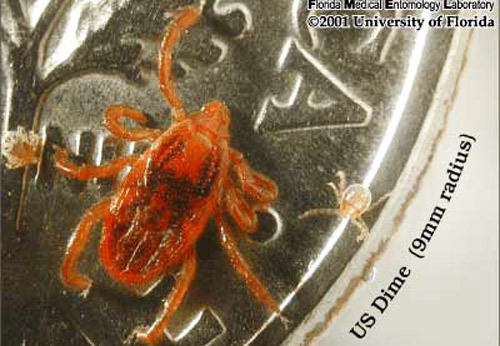 The cattle fever tick was eradicated from the U.S. in 1943 and does not feed on dogs, therefore ticks found in Florida now with a hexagonal basis captituli are almost certainly Rhipicephalus sanguineus. Any tick found with white coloration on the dorsal surface (opposite of side where legs are attached) is not a brown dog tick. Please refer to Ticks in Florida for information on the most common ticks in Florida. Figure 4. Hexagonal basis capituli, an identifying characteristic for the brown dog tick, Rhipicephalus sanguineus Latreille. Photograph and drawing by James Newman, University of Florida. 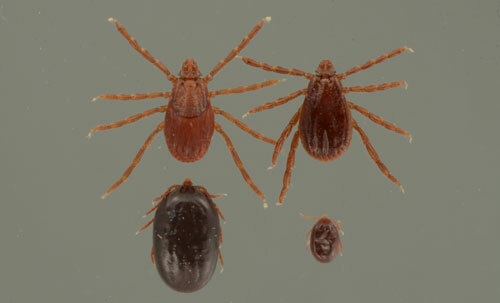 The brown dog tick is a three-host tick; meaning each active stage (larva, nymph, and adult) feeds only once, then leaves the host to digest the blood meal and molt to the next stage or lay eggs (Figure 5; Sonenshine and Roe 2014). Mating of brown dog ticks occurs on the host following the stimulation of blood ingestion. An adult female will feed on the host for about one week, then drop off the host and find a secluded place for egg incubation for about one to two weeks. Cracks and crevices in houses, garages and dog runs are ideal locations. She may start laying as soon as four days after she completes feeding and drops off the host, and can continue to lay for 15 to 18 days. As she lays the eggs, she passes them over her porose areas (specialized areas on the back of the basis capituli) to coat them in secretions that protect the eggs from desiccation (Sonenshine and Roe 2014). A fully blood-fed female brown dog tick can lay over 7,000 eggs, with 4,000 on average (Figure 6; Koch 1982). The number of eggs laid depends on the size of the tick and the amount of blood she ingested. The female dies after she finishes laying her eggs (Dantas-Torres 2008). The larvae hatch 6 to 23 days later, and begin to quest, or look for a host. The host seeking activity, which occurs in all the active stages, results in increased movement of ticks towards a dog, thus owners often see ticks drawn out into the open on furniture, baseboards, carpeting and dog bedding (Dantas-Torres 2010). 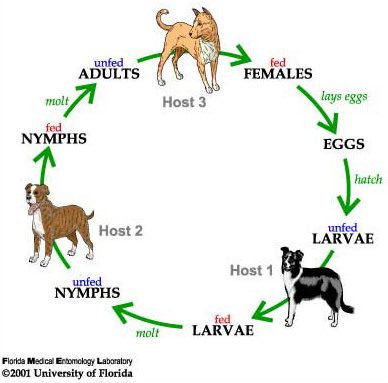 Larvae feed for 5 to 15 days, drop from the dog, then take about one to two weeks to develop into nymphs (Ioffe-Uspensky et al. 1997). The nymphs then find and attach to another host (possibly the same dog), feed for 3 to 13 days, fall from the dog and take about two weeks to develop into adults. As adults, both males and females will attach to hosts and feed, although the males feed only for short periods. Figure 5. Life cycle of the brown dog tick, Rhipicephalus sanguineus Latreille. Drawing by James Newman and Leah LeFevre, University of Florida. Figure 6. Six brown dog tick females, Rhipicephalus sanguineus Latreille, laying eggs. Photograph by Amanda L. Eiden, University of Florida. The length of time each stage feeds, and the time required for development and molting, are temperature dependent. Feeding and development times are generally faster at warmer temperatures. Survival is generally higher at cooler temperatures and higher relative humidity, but these ticks are tolerant of a wide range of conditions. Although ticks are visible while looking for a host and feeding, they are not easily observed while digesting their blood meals, molting, or laying eggs, due to their cryptic behavior. This can lead to the apparent disappearance and then re-appearance of ticks in a residential infestation. The overall development from egg to egg-laying female can be completed in just over two months, but frequently it will take longer if there are few hosts available or under cooler temperatures. Ticks are notoriously long-lived and can survive as long as three to five months in each stage without feeding. On average, two generations may occur per year, but up to four generations per year have been documented in countries in tropical regions, such as Brazil (Louly et al. 2007, Silveira et al. 2009). In Florida, the cycle can occur year-round both inside residences and in outdoor kennels and dog runs. In the U.S., dogs are the primary host for brown dog ticks in all stages and are required for the establishment of a large tick population in the home (Dantas-Torres 2008). The preferred attachment sites on a dog are the head, ears, back, between toes, and axilla (the area directly under the joint where the legs connect to the body) (Figure 7; Dantas-Torres 2010). It is important to check these preferred attachment sites on your pet when you are trying to prevent a tick infestation or manage one that has already established. Each active stage must locate a host; in a domestic environment, this may result in feeding on the same dog (if there is only one dog present). Figure 7. Brown dog ticks, Rhipicephalus sanguineus Latreille, on dog. Photograph by Jerry Butler, University of Florida. Control of this tick by removing dogs is likely to result in alternative host selection. If it cannot find a dog nearby, this tick is likely to feed on other mammals, including domestic animals and humans. Elsewhere in the world, this tick is more frequently found feeding on other mammals. This difference in host preference is not completely understood, but is probably related to animal availability and differences in the populations from the original introductions into new areas. In the southeastern U.S., the brown dog tick occasionally has been reported feeding on rodents and deer, but most collections are from dogs and (much less commonly) humans. Immature ticks are more likely to be found on humans than adult ticks (Demma et al. 2005). Although cats and other domestic animals are not preferred hosts ticks have occasionally been found to feed on them. Therefore, all animals in a household should be checked for ticks and attached ticks removed. The population can reach dramatic levels in residences and kennels. 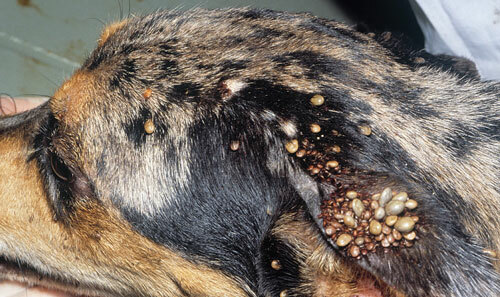 High infestation levels can cause skin irritation in dogs. The brown dog tick is a vector of several pathogens causing dog diseases including canine ehrlichiosis (Ehrlichia canis) and canine babesiosis (Babesia canis) in the U.S. These rarely cause disease in humans; only a few cases are known. In dogs, symptoms of canine ehrlichiosis include lameness, depression, weight loss, anorexia, and fever (Harrus et al. 1999); for babesiosis symptoms include fever, anorexia and anemia (Boozer and Macintire 2003). Both pathogens have been found in Florida. Rocky Mountain spotted fever, caused by Rickettsia rickettsii, is a severe tick-borne disease in humans. This pathogen was reported to be transmitted by brown dog ticks in Arizona and California (Demma et al. 2005, Wikswo et al. 2007), but transmission of Rocky Mountain spotted fever by brown dog ticks has not been reported in other states. Rocky Mountain spotted fever is more commonly transmitted by the American dog tick, Dermacentor variabilis (Say), and Rocky Mountain wood tick, Dermacentor andersoni Stiles, in the U.S. However, brown dog ticks are the major vector of Rickettsia rickettsii in Mexico. Rocky Mountain spotted fever has been considered an epidemiologic emergency in Mexico and the case-fatality rates can be high without prompt and correct treatment (Alvarez-Hernandez et al. 2018). The symptoms of Rocky Mountain spotted fever include sudden onset of fever, significant discomfort, rash, and headache (Dantas-Torres 2007). In parts of Europe, Asia and Africa, Rhipicephalus sanguineus is a vector of Rickettsia conorii. Subspecies of this bacteria are the causative agents for Mediterranean spotted fever and some types of tick typhus (Parola et al. 2009, Zemtsova et al. 2010). Rickettsia conorii can be transmitted from a female tick to her offspring and transmitted between infected and uninfected ticks when they are feeding simultaneously on same host (Mumcouglu et al. 2002, Zemtsova et al. 2010). Rhipicephalus sanguineus has not been shown to transmit the bacterium that causes Lyme disease. The best management strategy is prevention of infestations in the residence or kennel, and this begins with regular inspections of dogs entering these facilities. Discuss utilization of tick control products with your veterinarian to ensure that your dog is healthy enough for these products and to choose an appropriate product. Preventing engorgement of the ticks on dogs is critical to management of the tick and the well-being of the dog, thus any attached ticks should be manually removed and the ticks killed, particularly the adult female ticks. Dogs should be examined regularly and attached ticks should be removed by tweezers or other specific tools for removing tick and disposed of carefully, such as freeze ticks for 24 hours and flush down toilet. Check dogs for ticks when returning to the house from kennels, groomers, dog parks, or other locations frequented by dogs. In addition, tick checks upon returning from any outdoor activity will help prevent bites by other tick species. To prevent infestations in homes and dog kennels, cracks and crevices should be sealed and grass and weeds should be kept short (Dantas-Torres 2008). Wash and dry dog beds and blankets with hot water and high dryer heat because high temperatures can kill the ticks that hide in them. Steam also can be used to kill ticks on unwashable items such as furniture. There are many over-the-counter and prescription-only topical and a few chewable products available for tick control, several introduced to the market in the past few years. However, high resistance of ticks to permethrin, the most commonly applied topical product, has been reported in the U.S, notably in Florida and Texas (Eiden et al. 2015). Rotation of products used to control brown dog ticks may slow down resistance development. Treatment with effective products for dogs that will visit areas with other dogs will minimize the chances of a dog bringing a tick into the residence or kennel. Treatment also will reduce attachment by other tick species, such as the American dog tick or the blacklegged tick. Once an infestation has started, thorough treatment of the infested areas by professional pest control operators is critical and it is important to explain to residents that repeated treatment may be needed to achieve successful control. In heavily infested residences or kennels, it is recommended that a professional pest control operator be hired. Contacting your local Extension office is strongly suggested, especially if an infestation is not resolved after a few months. It cannot be stressed enough that pet owners should consult with their veterinarian about the most appropriate treatment for your dog to ensure that they are healthy enough to be treated, and as specified by law, follow label directions. Cats and certain dog breeds are considerably more sensitive to certain pesticides and appropriate treatments must be used. Other mammals should be monitored and treated if necessary. People should check themselves regularly; although uncommon in the U.S., this species will bite humans. The earlier the infestation is discovered and addressed, the easier it will be to eliminate. Monitoring and grooming dogs, particularly upon return from kennels or locations where other dogs are present, is the best way to detect infestations early. For more information, please see the Insect Management Guide for ticks. Alvarez-Hernandez G, Ernst K, Acuna-Melendrez NH, Vargas-Ortega, AP, Candia-Plata MD. 2018. Medical knowledge related to Rocky Mountain spotted fever in Sonora, Mexico. Transactions of the Royal Society of Tropical Medicine and Hygiene 112: 109-114. Best Management Practices For Brown Dog Ticks. University of Florida. Pest Management University. Dantas-Torres F. 2007. Rocky Mountain spotted fever. Lancet Infectious Diseases 7: 724-732. Dantas-Torres F. 2008. The brown dog tick, Rhipicephalus sanguineus (Latreille, 1806) (Acari: Ixodidae): From taxonomy to control. Veterinary Parasitology 152: 173-185. Dantas-Torres F. 2010. Biology and ecology of the brown dog tick, Rhipicephalus sanguineus. Parasites & Vectors 3: 26. https://doi.org/10.1186/1756-3305-3-26. Demma LJ, Traeger MS, Nicholson WL, Paddock CD, Blau DM, Eremeeva ME, Dasch GA, Levin ML, Singleton JJ, Zaki SR, Cheek JE, Swerdlow DL, McQuiston JH. 2005. Rocky Mountain spotted fever from an unexpected tick vector in Arizona. New England Journal of Medicine 353: 587-594. Eiden AL, Kaufman PE, Oi FM, Allan SA, Miller RJ. 2015. Detection of permethrin resistance and fipronil tolerance in Rhipicephalus sanguineus (Acari: Ixodidae) in the United States. Journal of Medical Entomology 52: 429-436. Harrus S, Waner T, Bark H, Jongejan F, Cornelissen AW. 1999. Recent advances in determining the pathogenesis of canine monocytic ehrlichiosis. Journal of Clinical Microbiology 37: 2745-2749. Ioffe-Uspensky I, Mumcuoglu KY, Uspensky I, Galun R. 1997. Rhipicephalus sanguineus and R. turanicus (Acari: Ixodidae): closely related species with different biological characteristics. Journal of Medical Entomology 34: 74-81. Koch HG. 1982. Oviposition of the brown dog tick (Acari, Ixodidae) in the laboratory. Annals of the Entomological Society of America 75: 583-586. Koehler PG, Oi F. 2017. Ticks. Electronic Data Information Source, University of Florida. (13 September 2018). Levin ML, Studer E, Killmaster L, Zemtsova G, Mumcuoglu KY. 2012. Crossbreeding between different geographical populations of the brown dog tick, Rhipicephalus sanguineus (Acari: Ixodidae). Experimental and Applied Acarology 58: 51-68. Louly CCB, Fonseca IN, Oliveira VF, Linhares GFC, Menezes LB, Borges LMF. 2007. Seasonal dynamics of Rhipicephalus sanguineus (Acari: Ixodidae) in dogs from a police unit in Goiania, Goias, Brazil. Ciència Rural 37: 464-469. Parola P, Socolovschi C, Raoult D. 2009. Deciphering the relationships between Rickettsia conorii conorii and Rhipicephalus sanguineus in the ecology and epidemiology of Mediterranean spotted fever. Rickettsiology and Rickettsial Diseases 1166: 49-54. Silveira JA, Passos LM, Ribeiro MF. 2009. Population dynamics of Rhipicephalus sanguineus (Latrielle, 1806) in Belo Horizonte, Minas Gerais state, Brazil. Veterinary Parasitology 161: 270-275. Sonenshine DE, Roe RM. 2014. Biology of Ticks, 2nd ed. Oxford University Press, New York. Szabo MPJ, Mangold AJ, Joao CF, Bechara GH, Guglielmone AA. 2005. Biological and DNA evidence of two dissimilar populations of the Rhipicephalus sanguineus tick group (Acari: Ixodidae) in South America. Veterinary Parasitology 130: 131-140. Walker JB, Keirans JE, Horak IG. 2005. The Genus Rhipicephalus (Acari, Ixodidae): A Guide to the Brown Ticks of the World, Cambridge University Press, U.K.
Wikswo ME, Hu RJ, Metzger ME, Eremeeva ME. 2007. Detection of Rickettsia rickettsii and Bartonella henselae in Rhipicephalus sanguineus ticks from California. Journal of Medical Entomology 44: 158-162. Zemtsova G, Killmaster LF, Mumcuoglu KY, Levin ML. 2010. Co-feeding as a route for transmission of Rickettsia conorii israelensis between Rhipicephalus sanguineus ticks. Experimental and Applied Acarology 52: 383-392. Photographs and Drawings: Amanda L. Eiden, James Newman, Leah LeFevre, Jerry Butler, Lyle Buss, University of Florida.